Note: This is the text of a despatch to the then Foreign & Commonwealth Secretary, Douglas Hurd, which I sent in January 1991 shortly before the end of my posting as British High Commissioner to Nigeria, my last African posting and the end of my involvement in African affairs which had begun in London in 1957. The despatch was classified CONFIDENTIAL. It has been declassified by the FCO and released to me under the Freedom of Information Act. I have put some comments on the despatch and on the contrast between the policies and attitudes in 1991 which it describes and those now, in 2009, on my blog: please see http://www.barder.com/1784. 1. Next month I leave Lagos and complete 17 years’ involvement in African affairs, 10 of them dealing with west Africa or southern Africa in London, and 7 as head of mission in the two most populous countries of black Africa, Ethiopia and Nigeria. Tidily, I end where I began, with Nigeria, whose constitutional and political problems I first tried to grapple with as a new entrant in the Colonial Office In Great Smith Street a third of a century ago. I leave Nigeria with many of the same problems unresolved – not, I think, for any lack of effort by ourselves as the colonial power or by the Nigerians themselves, but chiefly because of the inherent difficulties we bequeathed when we gummed together such a big, unwieldy entity in such a casual manner 90 years ago. 2. As I leave the continent, Africa ranks at Its lowest in any British Government’s scale of global priorities for 100 years or more. There are intense pressures, from Ministers downwards, for sharp cuts in the resources we devote to Africa in money and manpower; and for some reduction in our commitments in Africa (although, illogically and characteristically, these are unlikely to be as sharp as the cuts in resources). As I shake the African dust from willing feet, it is natural to wonder why this down-grading of Africa is taking place; whether it Is politically and economically justified; and what might be the implications for British interests. Why at we demoting Africa in our priorities? (a) Decolonisation fatigue. Shedding our colonial responsibilities In Africa has been a long, wearing process, bringing us more obloquy than ovation and often yielding more disappointments than evident successes. For 3 decades, completing this process – especially in Kenya and then Rhodesia – and ridding ourselves of the international incubus of our involvement in apartheid South Africa have been our overriding aims in the continent. Now that they are achieved (or, in the case of South Africa, within sight of being achieved), it is natural to feel that we are entitled to turn our attention elsewhere. To recognise, define and substitute new needs and objectives requires an effort of imagination and will that does not come easily to the exhausted. (c) The end of the cold war. As long as the Soviet Union and its erstwhile allies were competing for third world hearts and minds, the west perceived the penalties of turning its back on the more western-oriented of the developing countries as unacceptably high. That constraint has gone. (d) The lack of an obvious economic role for Africa. Until relatively recently, Africa has been regarded as a useful — even necessary — source of cheap raw materials, and a worthwhile market for the developed world’s finished products. But as cheaper artificial substitutes for Africa’s raw materials have become available, as well as for other reasons, the terms of trade have turned against Africa, with disastrous consequences for the continent’s earning power; and thus for its value as a market for the west’s exports. The process has been further aggravated by corrupt and incompetent management of production processes, leading to falls in the quality and reliability of African traded goods. Africans well understand the need for them to diversify their economies into new areas where world demand will rebuild export earnings. But they lack the resources (or the credit-worthiness required to borrow them) which they need if they are to undertake such a massive transformation of the economic systems inherited from their colonial masters. Meanwhile Africa seems – is – of declining economic relevance to the rest of the world. (e) Perceived mismanagement by Africans of their own affairs. Again, undeniably true, although some at least of Africa’s most pressing problems are not in fact attributable to the short-comings of African leaders. However, the issue is not who is to blame for the African mess, but whether we can safely and cheaply afford to ignore it. It is evident that all 5 factors have substance. But the striking thing which they have in common is that they explain growing indifference to Africa: they do not justify it, nor do they demonstrate that indifference is necessarily our own interests. Are we politically or economically justified in reducing our commitment to Africa? 5. Africa certainly has little commercial significance. 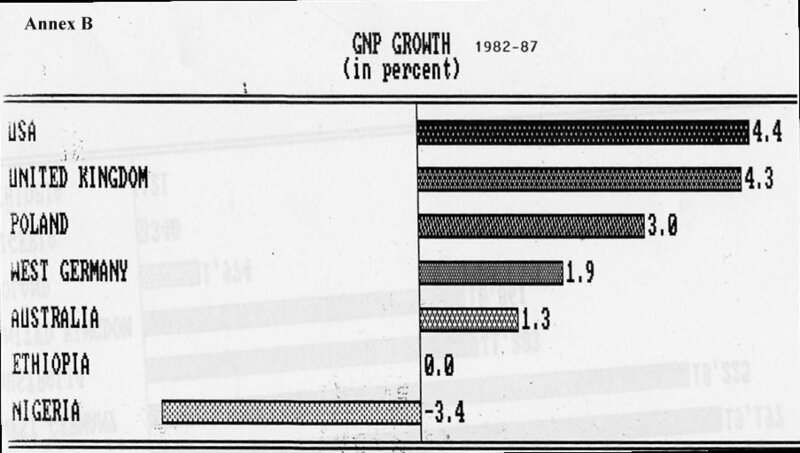 In 1988 it accounted for a mere 2.61% of world trade (but nearly 12% of the world’s population). Central and south America were responsible for almost half as much again as Africa (3.5%): Japan alone for 7.7%. As already noted, Africa’s importance and reliability as a source of traditional raw materials have declined. However, the African countries which produce and export oil (and gas, now or soon), while relatively few in number, include Nigeria, which alone contains almost a quarter of the population of black Africa; and energy supplies from an area which is not subject to the stresses and conflicts of the Middle East are not to be sneezed at. Already Nigerian oil is important to the United States and some western European importers. Western oil companies have very large and growing investments in Africa. Southern Africa will also remain, for the foreseeable future, a major source of vital metals and minerals. Of course this is as much of concern to other western countries as it is to Britain. But our investments in oil and minerals are great and our own reserves of oil are already declining. 6. Politically, the end of the great confrontation between international Leninism and western liberal values makes Africa more, not less, relevant to the kind of world we and our children are going to live in. The remaining global fault-line is that which separates the rich white (and, increasingly, brown or honorary white) section of humanity from the poor and mainly black. It is this division more than any other which now threatens future conflict, insecurity, violence and destruction. How this explosive incongruity comes to be resolved – bloodily or peacefully – will depend significantly on events in Africa. The escalating clash between western values and radical Islam, which is in part a function of the rich/poor, white/black divide, will also play itself out in Africa among other areas: the seeds of that conflict have already been planted, the first shoots manifestly appearing. It is difficult to see how a western country which aspires to a global role can contemplate even partial withdrawal of interest from one of the two or three most pressing issues of our generation; disclaim its responsibility for carrying its share of the burden; or seek to reduce its ability to play a part in bringing about a resolution of the next act in the drama. mismanagement of the decades since independence and a willingness to put things right. But it becomes more and more evident that Africa’s problems simply cannot be solved by Africa’s own unaided efforts. Structural adjustment (as I have argued in an earlier despatch) is a necessary but not a sufficient condition of economic recovery. A very large-scale transfer of real resources to the poor countries of Africa is an absolute necessity if Africa is to stand any chance of overcoming the enormous problems of declining demand for its raw materials and agricultural products; foreign indebtedness; environmental degradation; and population growth at rates which outstrip the increase in both national income and labour productivity. All these problems can be overcome, but not without western help on an unprecedented scale. 8. If that help is not forthcoming, the prospect of a general collapse, although still only a worst case scenario, is bound to become much more real. We cannot always base our plans on the gloomiest assumptions, but we need to be clear about the possible consequences of the policies we adopt. Increasing impoverishment and unemployment in the towns, spreading break-down of basic services (including health, communications, food distribution networks), failure of the security forces to contain violence and theft, growing inter-tribal and inter-regional conflicts – all this can already be seen in embryo in many parts of Africa; and if it becomes general, it will cause a swift descent into massive starvation, disease, violence and collapse. These will in turn prompt significant movements of populations in search of food, safety and a future for their children. A disaster on such a scale could not be quarantined inside Africa. The rest of the world could not turn its back while more than half a billion people were exposed to an experience of this character. But once the collapse begins, the cost of arresting it will rapidly become immense. Prevention is cheaper as well as better than cure. 9. These may be considered in the context of our national domestic interests, our interests as a member of the European Community and our global interests. 10. The Ethiopian famine of 1984-85 demonstrated that public opinion in Britain is capable of being aroused by the spectacle – especially on television – of human starvation and poverty. The effect was to compel government to be seen to be responding on a scale which went a fair way towards satisfying what the electorate clearly demanded. Similar constraints on the freedom of action of governments have been imposed through television in the past by the Biafran conflict (in Britain) and Vietnam (in the United States). It is true that efforts to arouse public opinion again over subsequent famine in Ethiopia have largely failed, but there are several factors at work here which would not apply to a general spread of hunger and starvation over much of Africa. Even if economic failure in Africa were to fall short of a spectacular collapse, and took the form of a gradual increase in poverty, disease and hunger, it seems unlikely that British public opinion would acquiesce indefinitely in the apparent indifference of its government. The fact that we have a substantial community of black (not to mention Muslim) compatriots, and a slowly growing number of black MPs, would tend to raise the political cost of inaction, or of a merely token response, by government. 11. Even if public opinion failed to compel a response, the reality of mounting poverty and degradation in Africa will force itself on the attention of the west. Failure of employment possibilities and of secure food supplies will compel large numbers of Africans to migrate in order to escape from the growing nightmare. There might well be a wave of economic refugees which will make the boat people seem like tourists. Because of Britain’s historic connections with so much of Africa, the pressure on Britain to open its doors to African immigrants on a very large scale would be intense. 12. Meanwhile in Africa itself large parts of the continent face the prospect of gradually degenerating into festering slums, breeding international drug trafficking, terrorism and disease, accompanied by inter-tribal warfare and endemic violence of all kinds. AIDS is already a multiplying plague. it will be impossible to screen Britain, given its intimate connections with so many of the most populous African countries, from the effects of these highly infectious conditions. 13. The cost of retrieving a situation of this kind in Africa would be exorbitant; certainly incomparably greater than that of acting now to arrest the decline and to bring current problems into the realm of the manageable. In the eyes of much of the world, modern Africa is more the creation of Britain than of any other single country. Britain could not hope to escape the obligation to contribute a significant share of the global cost of either a rescue operation after a disaster, or remedial action to forestall it. There is an overwhelming case on financial grounds alone for acting sooner rather than later, collectively, to provide the resources required for removing most of the debt burden from African countries (provided that they are committed to active economic reform), for arresting environmental degradation, and for restoring the physical and human infrastructure sufficiently to permit diversification of economic effort and its re-direction into areas that will eventually become self-financing – as well, incidentally, as making a more positive contribution to world economic activity. 14. In a post-communist world increasingly divided into continental trading blocks, Africa has no developed area to turn to as trading partner, aid donor and protector, other than western Europe. Latin America and the Caribbean are natural elements in the North American sphere of influence. Asia and the Pacific Rim are rapidly becoming an economic force in their own right, powered by Japan and the other newly developing economies, and also closely linked to the United States. Africa, almost entirely made up of former European colonies and still condemned to live within the borders drawn by Europeans, is bound to be the protégé of western Europe. In some respects this seems to have been more readily accepted by our EC partners than by ourselves, even though it is Britain and France, followed at some distance by Italy, Germany and Belgium, which have had much the closest historical connections with Africa and still maintain the greatest interests and influence in the continent. The aid performance of the 17 major donors, including the Twelve, in 1987 tells, from our point of view, a sorry story. Britain’s aid as a percentage of GDP was the lowest of any of the 17 apart from Austria (an anyway embarrassing analogue) and the United States (whose total aid programme was more than 4 times as big as ours). Although a healthy share of the aid which we do give is allocated to Africa, the size of our aid in total is not something to be proud of. The promise of some increase is welcome, but nothing so far envisaged comes near to matching the scale of the need or the extent of our responsibilities as Europeans. 15. Any move by Britain to reduce the scale of its representation in Africa by any significant amount would be seen by our European partners as further evidence of our refusal to accept the implications of our own and Europe’s history. Without an adequate and effective diplomatic presence in each of the main countries of this diverse and splintered continent, we could not hope to manage an adequate aid programme; nor to exercise the influence over the policies of African governments which is an inescapable condition of our ability to ensure that the aid we give is put to optimum use. Since Africa of all continents (with the possible exception of Europe and the Middle East) is the home of the world’s most intractable and menacing problems, we would be doing ourselves a powerful disservice – not least in the eyes of our fellow- Europeans – if we deliberately deprived ourselves of the eyes and ears we need to monitor events, to assess them in terms of British interests, and to manage our response to them. We cannot rely on others who have far less knowledge and understanding of Africa than we to do this for us, without serious damage to our status as a significant world power and to our ability to behave like one. 16. These are not questions of guilt or compensation for past wrongs, real or imaginary. They relate to real, practical problems in an area with which we have special connections that imply special responsibilities. It seems inconceivable that the Community as a whole would be prepared to turn its back on a human tragedy in Africa. If we are serious about our determination to play an active part in Europe, we must face the consequence for our contribution to a European effort in Africa, which indeed we are uniquely well qualified to inspire and lead (as anyone who has participated in the EC’s Africa Working Group, or in discussion of African affairs in an EC Heads of Mission meeting, can testify). 17. 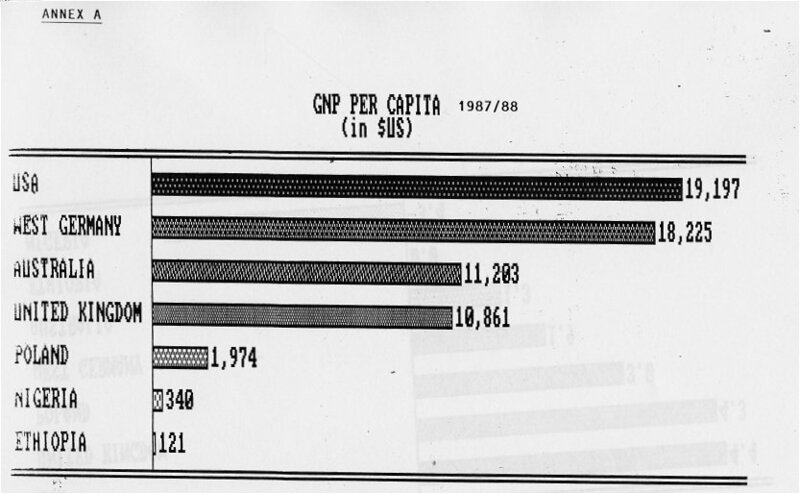 In 1987, national income per head was £6,537 in Britain, £10,056 in the United States and £15,058 in Switzerland. In Nigeria – by no means the poorest country in Africa, but much the most populous – it was £170: 2.6% of that in Britain, 1.13% of that in Switzerland. 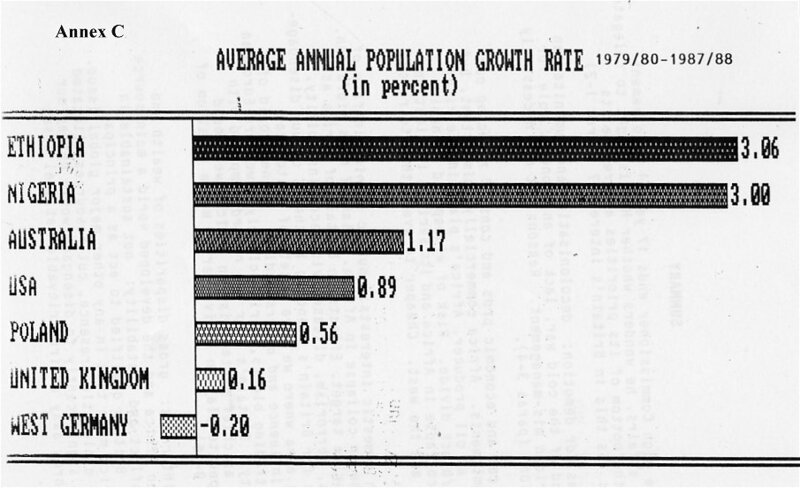 The charts in Annexes A-C, attached, tell a vivid story. 18. This cannot be a sustainable situation, even in the medium term. Such grotesque disparities in the human condition are an inevitable source of conflict and instability. It is a century since British people ceased to be willing to tolerate massive inequality of wealth and income within their own society. The time has surely come when we should tackle an even more offensive situation in the global village. 20. Against this background, for Britain to start a process of disengagement from Africa, principally for reasons of’ financial stringency, would be widely and justifiably seen as implying at best a sad failure to understand and accept our own history; and at worst as a betrayal of that history which others in the world, and many among our own compatriots, will neither understand nor forgive. 21. I am sending copies of this despatch to the Minister for Overseas Development and to HM Representatives or High Commissioners at Nairobi, Addis Ababa, Pretoria, Accra., UKMIS New York and UKREP Brussels. 2. Reasons for demotion: decolonisatlon and humanitarian fatigue, end of the cold war, lack of an economic role for Africa, African mis-management. Reasons but not necessarily justifications (paras 3-4). 3. Political and economic pros and cons of reducing our African commitments. Africa commercially unimportant, but significant as oil producer. Africa’s place in the rich/poor, white/black divide. Risk of widespread economic decline or collapse in Africa and its serious implications for Britain and the west. Cheaper to avert than to rescue (paras 5-8). 4. British domestic interests: public opinion in face of sharp decline or collapse in Africa. Risk of mass migration, with UK as prime target. Effects on Britain of Africa as slum: drugs, terrorism, disease, violence, instability. Implications for Britain’s standing In the EC of our disengagement from an area where we have assets of historical connection, influence and understanding. In new world of continental trading blocks, Africa clearly a western European responsibility. Britain’s poor aid record compared with EC partners: as chief protagonist in Africa, we should remain equipped to play an active part. Not a question of guilt (paras 9-16).